Unique Moments Photography from Gig Harbor Washington travels to many areas to cover weddings. Seattle, specifically the Lake Union cafe is one of our favorite venues for the Seattle area. The Venue is wonderful for receptions and smaller ceremonies. 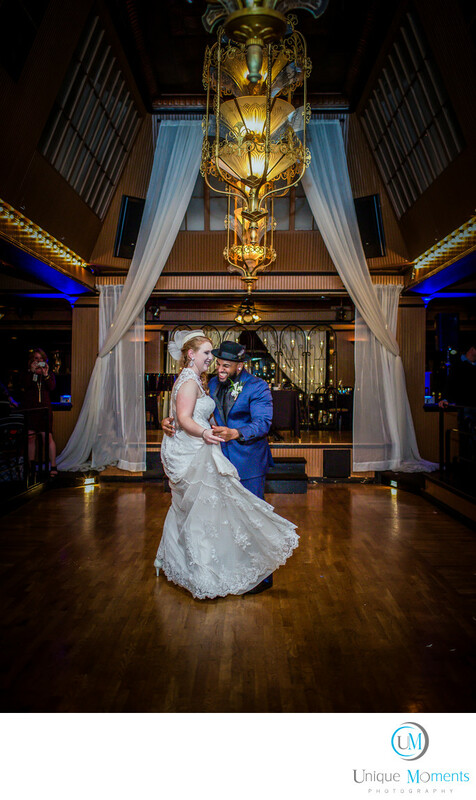 The venue is unique and offers couple wonderful photo opportunities for their receptions. Its dark inside so be sure your photographer has a camera and lighting that can handle the dark environments. We have been there 3 times and minimum ISO settings usually start at 3200-4000 ISO for pictures. Canons 6D, 5DMK111's and the 1Dx series perform very well inside this venue and color is also very orange so gelling is a must for optimal results with your speed lights. There are decent places to capture images near Lake union cafe as well but November through January weddings deal with it getting dark outside at 4:30PM. So our suggestion is to get to the docks early. The Lake Union cafe has awesome food and the Staff is always top notch. Your guests and family will not be disappointed with this venue. We Highly recommend for your smaller wedding and reception needs. The Dance floor in this picture also serves as the wedding area. We would estimate the 60 + is going to be really tight for an inside ceremony.